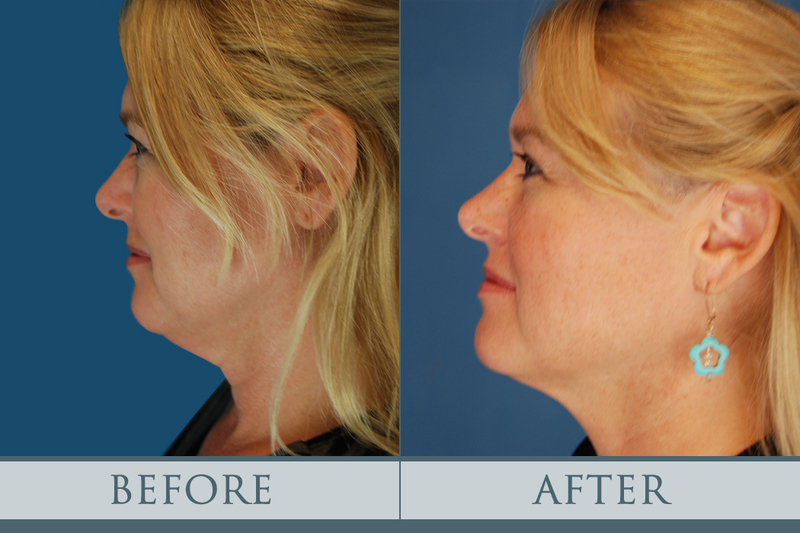 KYBELLA® is the first and only FDA approved injectable treatment to reduce fat under the chin. The active ingredient in KYBELLA® is synthetic deoxycholic acid. Deoxycholic acid is a naturally occurring molecule in the body that aids in the breakdown and absorption of dietary fat. When injected into the fat beneath the chin, KYBELLA® destroys fat cells, resulting in a noticeable reduction of fullness under the chin. Once eliminated, these cells can no longer store or accumulate fat, so there is little to no chance of regaining that double chin appearance. The process takes about 20 minutes, depending on the amount of fat under your chin and number of injections done. Following treatment, you may experience some swelling and bruising under your chin, but should be able to resume regular activities very quickly. We will work together to determine the perfect KYBELLA® treatment for you, depending on your chin profile and desired results. Treatments are often given one month apart with a maximum of six treatments per patient. If you’re interested in getting a KYBELLA® treatment, please don’t hesitate to call us or visit the KYBELLA® website to learn more about this magical treatment.